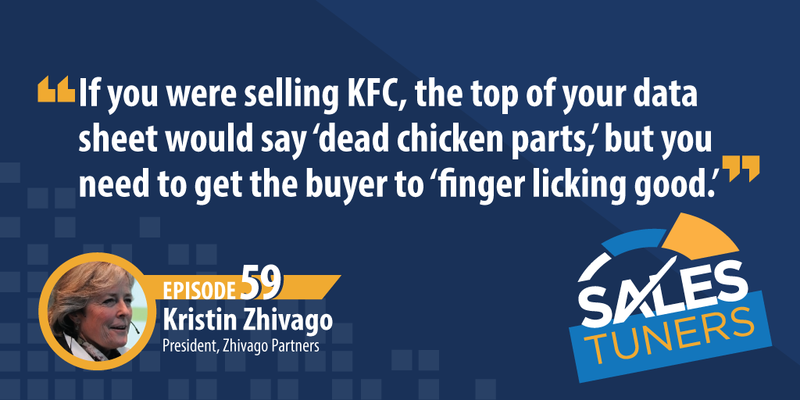 Kristin Zhivago (@KristinZhivago) started her career by struggling to answer the question “how is this drill bit better than the other one I’m using now?” This experience propelled her to learn as much as she could about both selling and technology and doing so specifically from the buyer’s perspective. Buyers are looking for honest, trustworthy salespeople to avoid embarrassment. In all interactions, they’re thinking, “what is going to happen to me after I buy?” They need someone who understands that need to help them avoid any fallout. Falling back to her initial sales experiences, Kristin learned early on about the importance of getting over yourself. Specifically, humbling yourself to realize you simply can’t know it all. Selling Your Friends is Not Traction: When launching a new product (or company for that matter), it’s easy to immediately to your friends for your first sales. The problem is, they have a vested interest in liking you and wanting to support you. Thus, you don’t have to overcome skepticism. You have to quickly learn the challenges non-affiliated prospects are going to raise and figure out how to sell to that in order to grow. You’ll Never Sell Anything While You are Talking: I know it almost sounds blasphemous, but customers will talk themselves into buying something if you let them. By asking the right questions and being courteous enough to shut up and actually listen to their answers, you’ll discover a whole new side of the sales process. Understand What Your Buyer is Up Against: Buyers are under assault every day. They’re getting bombarded with spam disguised as prospecting, dodging calls by getting rid of their voicemail, and making sense of the countless salespeople lying to them to get a deal done. What they really want to know is what happens to them after they buy from you. Will you make them look like a hero or a chump?